Fats - The American Heart Association encourages people to focus on replacing high-fat foods with vegetables, fruit, poultry, lean meat, whole grains and fat-free or low-fat dairy products. The average American is still consuming about 15% of total calories as saturated fat where recommended amounts are 10% or less. Individual food items served at school will not contain more than 23 grams of fat with an exception of one individual food item per week. No food items can exceed 28 grams of fat at any time. (with peanut butter as an exemption). 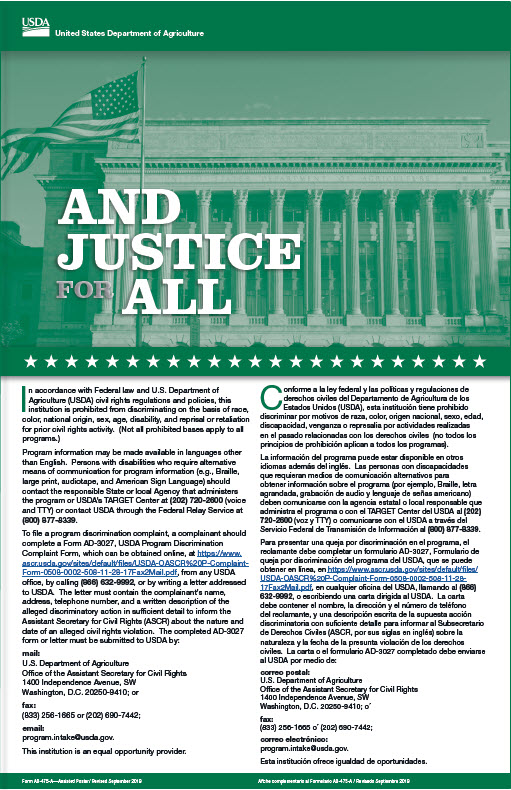 We do not allow Deep-Fat Frying as a method of on-site preparation of meals at any of our schools. Some of 10 Worst Drinks in America: Watch out for high fat foods and drinks outside of school that masquerade as being healthy. Take a look at some of the 10 worst drinks in America. What single serving bottle of childrens juice has the equivalent of 7 bowls of Whip Cream? What smoothie has the same amount of fat as 20 Reese's Peanut Butter Cups? What flavored water has the same about of sugar and fat as 2 Chocolate Eclair ice cream bars? What tea has the equivalent amount of sugar as 7 bowls of Fruit Loops? Be smart when you choosing your food and drinks...and read the nutrition label! 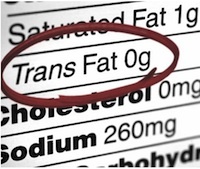 Health professionals recommend replacing some of the saturated fat and all trans fat with nonhydrogenated monounsaturated and polyunsaturated fats. Saturated fats are found in foods such as meat, cheese, whole milk and ice cream. Sodium - We have aggressive goals for reducing sodium with targeted implementation over the next 10 years. By reducing foods that are processed and choosing more consumption of fresh fruits and vegetables, and dairy is a good way to lower sodium consumption. Your body only needs about 500 mg of sodium per day however the average American diet exceeds the RDA amount of 2300mg, while people with high blood pressure should consume less than 1500mg/day. 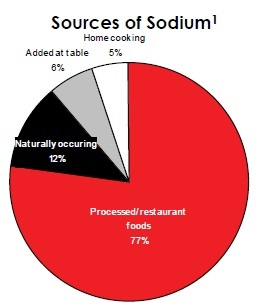 Most of the sodium consumption (77%) in the American diet comes from processed foods, 12% is naturally occurring, 6% is added at the table and 5% is added during cooking. An important way to reduce sodium consumption is in food selection. Includes any carbonated beverage, including those with added nutrients such as vitamins, minerals and protein. Includes any frozen, sweetened water such as popsicles and other "...sicles" and flavored ice with the exception of products that contain 100% fruit or fruit juice. Includes any flavored products made from natural or synthetic gums and other ingredients that form an insoluble mass for chewing. Includes any processed foods made predominantly from sweeteners or artificial sweeteners, including hard candy, jellies and gums, marshmallow candies, fondant, licorice, spun candy and candy-coated popcorn.